She’s Left Me Now – The album opener is probably the most country song I’ve ever recorded, a feel which suits the lyrics I think. The opening line came from someone on TV talking about really spoiling their girlfriend on their birthday or some such occasion, and I was tickled by the wordplay of “spoiling” and “ruining” and how they could describe the way a couple treat each other at the start and then the end of a relationship. I can’t believe – that she’s left me now, That she’s left me now. In that time before she’d ever thought to leave. I guess that’s why, She has left me – now, Why she’s left me now. ALL YOUR MOVES – This tale was inspired, improbably, by a report on the radio of the death of a politician, who in his time had been a senior cabinet minister in the British Government but had scuppered his career by getting his secretary pregnant. The report went on to mention other politicians who had married their secretaries, which made me wonder how those women felt when their husbands went on to hire new assistants. The song has a wife voicing her suspicion when she sees her husband and his new secretary. You and I – she’s now our third, Gasping at your every word. The same ones you’ve always used. But I’ve been there and I’ve felt that touch, It tells tales of shared secret stories and such. Where she stands I stood, And I fell for them too. Like an amateur play which has actors too old for the parts. We had nights just like that too, I remember everything that we’d do. Where she stands I stood, They worked on me too. Chimed – A song which began at the piano after I’d spent some time playing Queen’s “Save Me”. It’s such a lovely piece, I really wanted to write something in a similar vein so I began fiddling about and came up with this. Although it sounds nothing like “Save Me” there are a couple of Queen-esque changes in there, and in recording I tried to replicate a certain guitar feel that Brian May achieves on some of the ballads. A last nod to Queen was the lyric in the second chorus – “Sweet Lady” is the title of a track on A Night at the Opera. With all the weight we’ve been bearing, We’re sure to be caught by the tide. So long sweet baby, You know it’s right. But we’ve the marks to remind us, Of words said which we can’t retract. So long sweet lady, You know it’s right. We can’t go on here, We can’t go on, It’s best to let go dear, We can’t go on. To bid bye-bye baby, The church bell has chimed. Used To Wear the Crown – A simple little guitar riff was the starting point for this track, and I think it works quite well acoustically but I love the recording on the album. Adding in the synth arpeggiator helps to drive it along, but what really delighted me was finding the synth voice for the solo. For some reason I thought a sound like the one used for “The Rockford Files” theme tune would be quirky and interesting…and I think it is! Seems you worked the usual magic up there. Just looking for the one, Who used to wear the crown. Time it goes on with its business, Without warning you you’ve had your day. While I’m looking for the one, Who used to wear the crown. All your amateur theatrics, Lost their allure now that you’re growing old. So you know we’ve got to make a change ‘fore everything is lost. I’m looking for the one, Who used to wear the crown. A Whole Heap of Trouble – The main chorus line of this came to me when I was walking to the shop, which means I have a recording somewhere of me singing into my phone – loudly enough to be heard above the traffic but not loudly enough to worry passers-by. I immediately thought of it in a live context and thought the recording should have a loose vibe, so this is my attempt to capture an early Elvis feel – complete with a knocked beat on an (old) guitar, a la “All Shook Up”, and a Jordanaires-style backing vocal group (comprising me, Alan R Davison and Martin Philip). I’m so tired of taking it, I’m going to run for cover. I took that girl along, And she got herself grabbed by the police. I’m going to run for cover..
Don’t Give Up On Me – I was really taken with the relaxed feel of the piano intro and verse when I wrote them, but because I didn’t have any strong lyrical idea beyond the first verse I considered ditching it. I kept going back to it though, to eventually finish it off with a lyric which is more of a peek at a situation, a little insight into something rather than a fully fledged story. That probably explains why this is the most instrumental track on the album. I’ll forgive the things you did, The lovers and the cash you hid my darling. So don’t give up on me. But don’t forget I’ve fought for you, Defended things I’d never do my darling. Battle Lines – This song was actually written before even LIFT had been recorded, and had been demoed in a fairly full way during sessions for that album. I had loved the feel of the demo but it wasn’t quite there and it was only when I went back to it when recording this album that I managed to capture the feel of the demo to my satisfaction. The track was written on mandolin (the first time I’d done that) and I love the way the melody line is carried by that instrument. 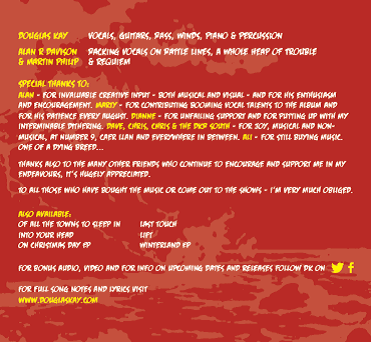 This appeared just before the release of VOLCANOES as one of 4 tracks on the WINTERLAND EP. About an hour from where I’d planned to, An hour away from where I’d said. And when they pulled her, Out of the wreckage, I was not there to talk her down. And after so long with strong defences, It seems we’ve both now lost control. But she had something which had made me, Follow her when she left. But when the good days, Have all been gathered, It’s hard to leave and hard to stay. And as he backed up to the window, Now we are even’s all she said. Wish I’d been as good, As I’d intended, But we’re both tired and growing old. Volcanoes – The title track on the album was written way back in about 2005, and although it had made an acoustic appearance on the mini-LP LATE (and featured in live sets from time to time), I really wanted to rearrange it and do a fuller recording. In preparation for this album I cut a verse and put the chorus in earlier, giving it a much tighter feel. I also found an instrumental combination I thought worked, with acoustic guitar carrying it but piano featuring quite prominently alongside bass and drums. By the disappointment, That we all must face. Offering the way out of the wreckage. Where We’re From – The first verse couplets came to me with the basic verse guitar part, in the way that phrases sometimes do without having any particular meaning. Musically, the verse is quite similar to a track on my first album, Turn Me Round, and because of that I hadn’t really intended to finish it. I found that I couldn’t get the bridge melody out of my head though, and kept singing that part through, so I took that as a sign it should be a complete song. As a bit of a nod to that first album I decided to have a couple of drum loops to drive the thing along. Make out you’re all the rage, And I will play along. I’ll be looking on, And give you what you want. And all has gone that was there to defend. Be difficult and thrawn, And I’ll collect your things. So why don’t you take me on, You can run this home. Liberty Bell – Another piano song with a relaxed vibe, and one which even in it’s basic form has a bit of a 1970s, American feel. During the recording I added the clarinet and electric piano to bring out the Joel-esque elements. Invites me in, To check you out. Winding up the joke-shop clock. We’ll find the things we’ve never found. Beckon me across, To where you stand. Rest of them be blown to hell, We’re re-branding the Liberty Bell, Just climb aboard. And then I guess we’ll just throw them out. 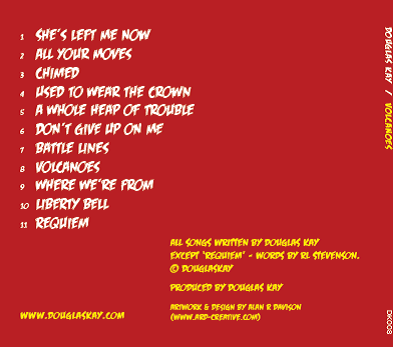 Requiem – The album’s closing track features the words of the Robert Louis Stevenson poem of the same name set to an original melody. The words for the coda are inscribed on RLS’ tomb in Samoa. I’d always been fond of the poem but it was after visiting The Writers’ Museum in Edinburgh that I decided I’d quite like to compose a piece to go with it (I’d previously done the same for the Robert Burns poem John Hghlandman, although that piece was written for my trad duo, The Sorries). Again I called upon Martin Philip and Alan R Davison to lend their vocal talents to the track. Your people will be mine, and your God my God. When you die I will die, There will I be buried.